This edition of Weekend Pick dives into our childhood roots and our love for big vehicles. As a kid I always loved to see semi trucks passing our car on the freeway and excavators tearing dirt hills apart. 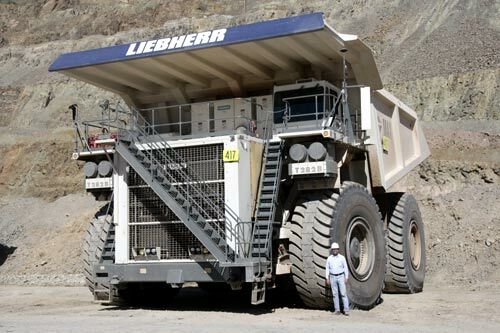 But to me the holy grail of childhood dream vehicles rested with the standard fire truck and the house-sized dump trucks that roll around at Kennecott. Fire trucks were cool mostly due to their size generally being out of place in the surroundings you’s see them in. They also have the authority to run red lights by turning on red lights and shoot a super powered jet of water at anything or anyone in 50 ft radius. Awesome. On the other hand we have the freaking huge mining operation dump trucks. Comparable to the size of a South Draper house, these trucks take the traditional “miles per gallon” and change it to “gallons per mile”. And although the fire truck can run through a red light, it’s safe to say that these can run through anything, red or not. Awesome. So make your pick and help crown the coolest childhood vehicle. Anonymous on September 8, 2010 at 10:04 pm. Deametriakohn on April 5, 2011 at 1:21 pm. Japan Used Trucks on April 28, 2011 at 10:51 am. Enjoyed reading your Article. In my childhood days I loved Mack Trucks. equus 3100 on May 5, 2011 at 5:55 am. I personally never got into fire tucks that much when I was younger. I did however loved playing with my dump trucks. I had a bunch of them.